I’ve said it before, and I’ll say it again. This is not your grandma’s wallpaper! Wallpaper has come a long way! The traditional place in a home in previous times have been in the entry/foyer and powder rooms. Many times dining rooms and ladies dressing rooms had wallpaper applied after the turn of the last century as well. I’ve always enjoyed specifying wallpaper for powder rooms because they’re the most frequently used space by guests, you can make a bold statement, and you’re not as at risk to get tired of a wallpaper if it’s not in your primary bathroom. My favorite powderroom I’ve done was Malcolm Jenkin’s. We outfitted his entire home, and the powder room was just as fun as the other spaces! 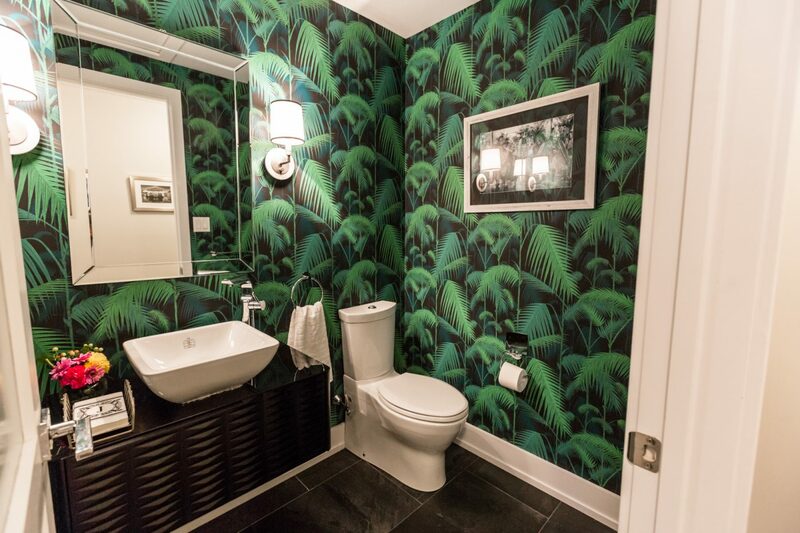 I specified a Col & Son palm tree wallpaper you can see here. To see the full job, visit Henck Design job- A Seamless Glamour. 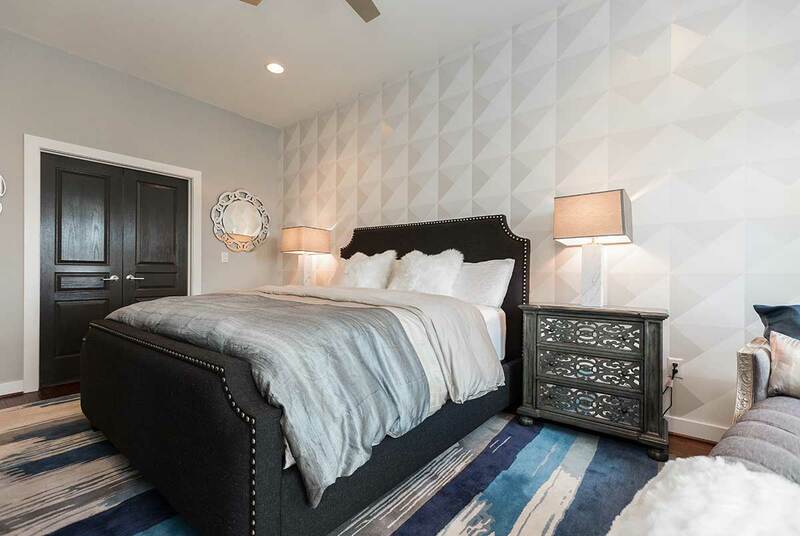 For Eagles Safety and NFL Star, Malcolm Jenkins’ home design in 2016, Henck Design outfitted his home with many “NOLA” references. While this bathroom is anything but traditional, it pays tribute to his time he played for the New Orleans Saints. Here are a few examples of powder rooms we’ve specified wallpaper in. I am curious to know which is your favorite! This traditional quatrefoil motif with light/dark contrast adds interest and keeps the character of this recently remodeled home Henck Design finished in 2017. 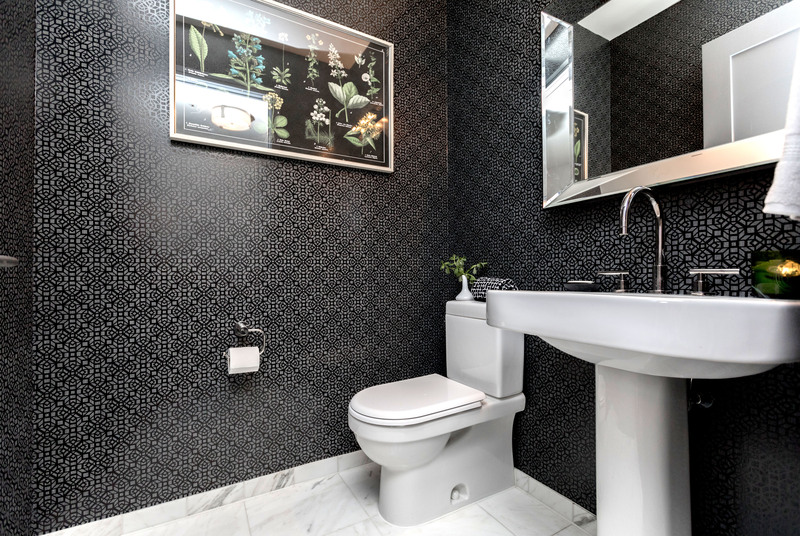 To add drama to any powder room, use a dark wallpaper and contrast it with Carrera Marble. Black & white motifs never date! Designers and architects have been using this combo for centuries. Henck Design selected this wallpaper for a recently completed job at Ritz-Carlton Residences in Center City, Philadelphia. 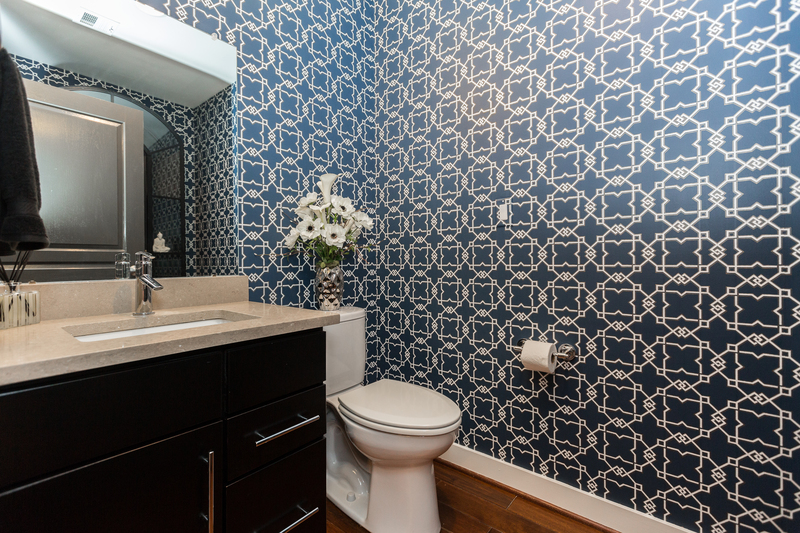 Light colored wallpapers are best when your vanity is a darker finish. This keeps elements from getting “lost” and keeps an open and airy feel. 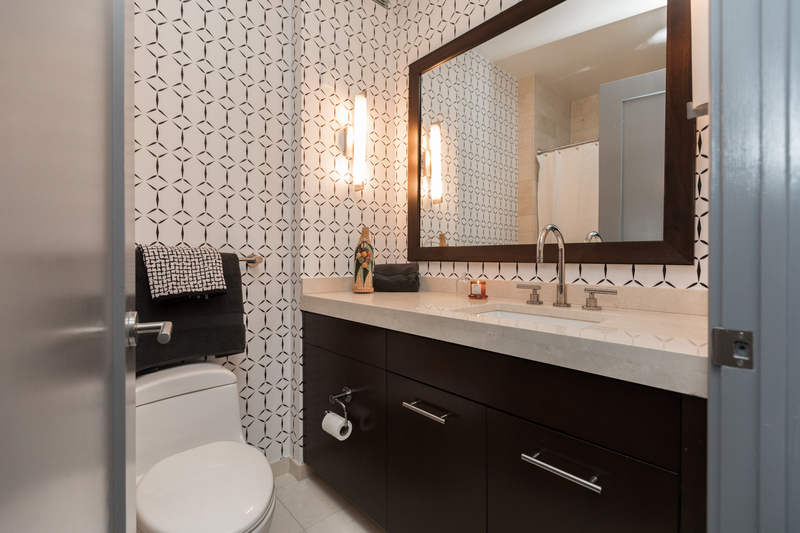 Henck Design selected this wallpaper for a bathroom in our client’s condo at The Ritz Residences. I don’t recommend wallpaper in a full bath unless the home owner is really committed to using the fan every time they take a shower. If the client lives in a particularly humid climate, I would only advise to have wallpaper in new construction. Many times moisture seeps into older homes a bit more and if you live in a tropical or subtropical climate and don’t have a relatively new HVAC system, issues can come up quickly. For more inspiration for how to approach modern day wall paper in your home, check out our Pinterest board with lots of examples of the latest and greatest wallpaper trends for bathrooms and more.